Caroline Stokes, Cal to her friends, was a science student at Simmons College from 1929-1933. She kept a scrapbook of her years at Simmons and her many adventures in Boston, Massachusetts. This scrapbook has been digitized as part of the ongoing Notable Women of Simmons College project. Look through her digitized scrapbook. Browse through individual scrapbook items. Learn more about Caroline's life and the historical context of her time at Simmons. Read more about the Caroline Stokes Digital Scrapbook project. 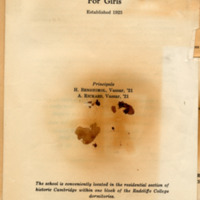 Pamphlet describing the Benshimol-Rickard School for Girls.